Regular brushing not only helps your dog looking the best, it also removes dead loose hairs and reduces shedding. Proper brushing distributes the natural oils whole over the dog’s body and keeps its skin soft and moisturized. A perfect brushing tool also eliminates mats and tangles from the deep inside of the long coat and get rid your dog from discomfort. Now it comes to choosing the best dog brush to keep your dog healthy and happy. There are various brushes available in the market with distinct quality and it’s a challenge to find out the right one depending on your dog breed. Regarding your dog’s coat, sometimes it is needed to use a slicker brush or short hair brush as your dog’s grooming toolkit. Brushing doesn’t totally depend on your dog’s size or shape; it also seeks your dog’s coat type. 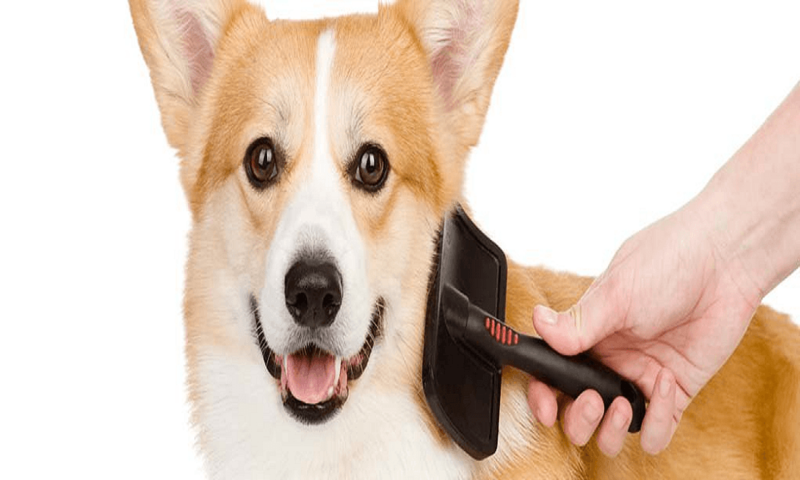 So, you need to select an ideal brushing tool based on various considerations which we have discussed below to get the optimum health benefit of your pup. Try to brush regularly from the beginning of your dog’s life to keep save from dead cells and harmful parasites. Now the question is which grooming tool is right for your dog or how do you select the best one? Here we have reviewed all popular models with their functionalities and associated a detailed buying guide to meet all your requirements about dog grooming. From the very beginning, shedding is the major concern for many dog owners. So, it is mandatory to collect proper tools that help you to pull out long hairs from your dog’s coat. 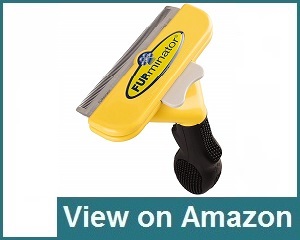 Furminator is one of the most popular dog grooming tool highly recommended by pet owners. It is perfect for both long and short-haired dogs available in five sizes include very small, small, medium, large and extra-large. Furminator deshedding tool diminishes shedding up to 90%. Its stainless deshedding edges touch the deep underneath and remove all the loose hairs. The small teeth of the brush also collect dead hairs without damaging the coat. Furminator tool is designed ergonomically; the handle makes it easy and comfortable to brush your dog’s coat. It is also known as professional groomer guaranteed to diminish shedding more than other brush. It is easy to play and stop the brush by pressing the eject button and you can smoothly control when using for a long time. It also saves your fingers when playing. 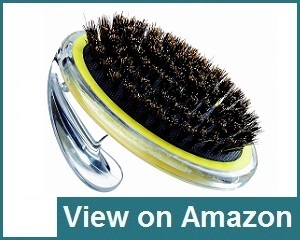 To get the optimal output you have to use this brush after the dog’s bathing and drying up its body hair. It works very efficiently on the dry coat. You should use a slicker brush to eliminate all mats from your dog’s coat before using this Furminator tool, otherwise, the brush will pull on the mats and your dog will feel a lot of pain. After all, Furminator is a great grooming tool for dogs and it is highly reviewed by professional groomers, pet owners, and veterinarians. Finally, everyone likes this de-shedding tool to gently remove loose hairs. KONG Zoom is another grooming tool absolute for removing loose hairs and help to stimulate natural oil on your dog’s skin and coat. It is made in the USA and comes with rubber bristles to massage your dog’s body while brushing. It has two available sizes; one is small and another one is regular. Small size is appropriate for puppies and regular size is for the boxer and similar breeds. Normally, KONG brush is recommended for all types of dogs and coat but practically it does not work well for loose hairs. Most of the time loose hairs stick to the bristles and pulled which makes a lot of pain to your pet. The rubber bristles of this brush are more comfortable than metal bristles and mild enough to apply on sensitive areas like paws, belly, and ears. 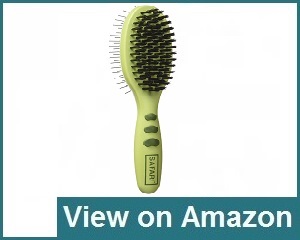 The additional facility of this brush is using as a shampoo brush at the bathing time. It helps to clean your dog’s skin and eliminate all hidden dirt and rubbish. Many dog breeds show anxiety when take bath but after getting rubber bristle’s massage action they become quite. Regular massaging with KONG ZoomGroom efficiently reduces your dog’s shedding and many pet owners agreed to purchase this brush to get its efficient performance. Oster Professional Undercoat Rake is one of the top pet grooming tool works very well on dog’s coat. 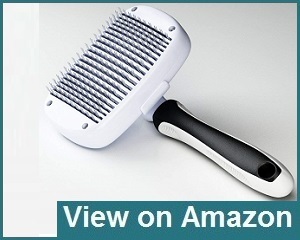 It is a complete grooming tool with dog hair rake and combs for various breeds and coats. Oster dog brush easily eliminates dead undercoat with marginal cutting and it is great for providing desire shape quickly. It is also prodigious for de-shedding, thinning and finishing your dog’s hair. Its rounded ends are safe enough to stop skin irritation. This brushing tool also contains sharp and long blades to separate your dog’s hair. 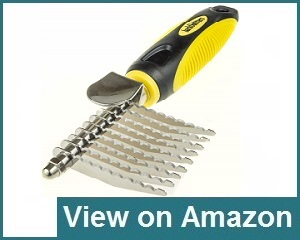 Including 18 teeth, these rake shedding brush works appropriately on medium and large breeds. Dog owners should be more careful to use this tool because it should not force too much to groom dog’s undercoat rake. If you press more, used blades may touch the skin end and your dog may feel pain. It is a common issue for most of the dog’s undercoat rakes and you should sincerely handle this tool. If you need a special grooming tool to reach deep of the coat and cut all long hairs then Oster Shedmonster shedding tool is ideal for you. You know, Excessive shedding is not always healthy for your dog but sometimes it becomes mandatory to shed a lot. Careful grooming doesn’t affect the dog’s skin or coat, even it is too much helpful to keep them happy and healthy. Basically, Oster Shedmonster is designed with stainless steel and its curved teeth are equipped to infiltrate deep down into the coat. The teeth of this tool seem scary but the edges are smooth and round which helps to deliver soft massaging on the dog’s skin. According to Oster Shedmonster Reviews, it is made with a non-slip ergonomic handle which is sturdier enough similar to other brushing tools. 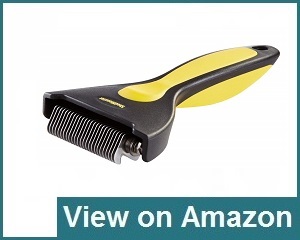 It is a dedicated grooming tool committed 90% diminishing in shedding. Definitely, it provides a great result if used regularly on both long and short haired dogs. Many dog owners enjoyed this brush being groomed and recommend as top grooming tool for their pet. Furmanator is our another top choice designed to support pets by eradicating tangles, mats and loose hairs. It also provides a silky and short coat without hurting your dog. It has dual flex heads specially made to follow the natural outlines of the dog’s body and stop brush burn. The one side of the brush comes with silky pins which helps to remove mats and tangles and the other side is bristle brush makes the coat smooth and shiny. The ergonomic design of the handle makes sure an easy and comfortable use of this dual brush. 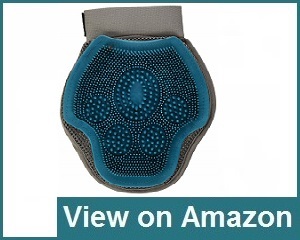 It is available in only one size and works well for small and medium breeds. 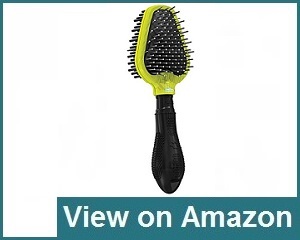 Structurally, it is 8.2 inches long and 1.6 inches wide across the head of this brush. Furminator brushing tool is more suitable from your pet’s primary stage of grooming. It is great for removing debris and smoothing coat and enough suitable for sensitive skin. Use this brush 1 or 2 times a week to eliminate extra hairs and keep your pet nice looking. You should make a physical inspection of your dog before using Furmanator dog dual brush. If the dog has bruises, sores or similar skin disease then provide a proper treatment by consulting with a veterinarian before brushing. Two-sided brush, one side is pin brush and another is bristle brush. This dog grooming glove comes with inner straps for comparatively smaller hands and makes sure a universal fit. The adjustable wrist strap of the gloves keeps your hands secure and comfortable. The mesh outside pass water instantly and encourages quick drying. The rubber side has a tiny brush like fingers that can groom, scrub and massage. At the other side has special fabric helps to pick up loose hairs. It is easy to groom your furry friend by using these gloves. This brush comes with two essential grooming tools. One side has bristle which is effective for smooth brushing and distributing natural oils throughout the coat. The other side has pins used to gently lift out hair and debris from the dog’s body. This quality brushing tool is recommended for short-haired dogs to eliminate shedding, mats, and tangles and promote healthy skin and coats for pets. This professional brush easily cleans your dog’s coat with the simple click of a button. It makes the grooming faster but allows you to control precisely and won’t wear your hand out. It removes all loose fur from your dog’s body by a few gentle strokes. That’s why professional dog groomers love this brush. If you use this brushing tool regularly your dogs won’t need to visit to the professional groomers can save your dollars. Conair Boar Bristle brushes are designed to fit effortlessly in the palm of the hand. Slip the grip through your fingers and hold the brush comfortably in the palm of your hand. Move it easily through short and curls coats and smoothly distributes oils in your pet’s fur. Regular brushing with this tool makes your dog’s coat natural, healthy and shiny. If you only choose one grooming tool for your dog or cat, a slicker brush is the best choice. The GroomEasy slicker brush is so versatile can perform a great job on almost ALL coats and breeds. A slicker brush is the best choice for dog lovers who want to groom regularly their dog’s at home. It is easy to run, just press the button on the handle and move over the dog’s coat. It removes all loose undercoat hair and your pet feeling fresh. The slicker brush works smoothly even on very tough and curly hairs that’s why pet and pet owners both become happy to use it. It is really too important to select the right brushing tool for your dog’s healthy and shiny coats. A wrong selection can damage your dog’s fur and skin and make a negative experience within it. But, the right tools allow your dog to enjoy the brushing session and make a strong relationship between owner and pet. There are various types of brush available on the market and here we have shown five different types those are special for their unique features. Slicker brushes are specially designed for pets that have long and thick coats of hair. 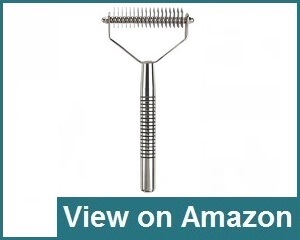 Normally, these are rectangular in shape with metal bristles help to remove tangles, loose hairs, and dead undercoats. The handle of the brush runs around a 75-degree angle and making easy to use over the dog’s coat. It is useful to use this brush on sensitive areas of your dog’s body like face, paws, and legs. It is important to apply a light touch if your pet has sensitive skin. Pin brushes are oval shaped and look like a pin holder with attached handle. Wire pins are tipped with rubber or plastic and designed for smooth and comfortable coating. Usually, these are come in two different styles and most effective to use on wooly and wavy haired dogs. Basically, pet proprietors use a pin brush to eliminate tangles from long-haired dogs. It is also good for raking dense double coat but you should be careful that the pins dong, lose their coating. Long strokes on coat help to remove all dead hairs and keep them looking best. Using bristle brush helps to remove dirt and debris from your dog’s coat and leave a nice shine. Bristle brush may natural or man-made but there are no metal pins include in this brush. Regular grooming with this brush promotes a shiny coat of your pet. If your dog has a short coat and they shed frequently, a bristle brush may perfect for them. Short bristles are closely spaced and perfect for shorter coat where longer bristles are for long-haired breeds. These are similar to rubber brushes great for removing loose hair and help in blood circulation while brushing. Rubber brushes can be the best alternative when the dog is sensitive to pin bristles. These are ideal for small dogs with a short coat or dogs that require less effort to clean shedding hairs. It seems like messaging a dog when brushing to collect loose hair from the body. Rubber bristles also work well to remove dead fur and provide shiny hair. Rubber brushes are waterproof and allow you to brush even when your dog is having the bath. These are available in arrays of sizes, styles, and bristles and perfect for brushing on your dog’s ears, paws, and tails very easily. Dog undercoat rakes specially made for removing undercoat and tangles. These brushes come with comparatively longer teeth to reach more inside of loose hairs. Sometimes they shaped like a shaving razor with single or double rows of pins. They are designed to apply with minimum pressure for safe brushing otherwise more pressure may damage their skin. There are various undercoat rakes on the market including different size, width and length of teeth offer you smooth brushing. Short coats: Short smooth coats commonly found in Hound, Chihuahua, and Retriever dog breeds. It is suitable to use a closely spaced soft bristle brush. Wiry coats: Generally, Terrier dog breeds are grown up with wiry coats and you should use a firm bristle brush like a slicker brush to manage your dog’s coat for easy brushing. Long flowing coats: Normally, Golden Retriever, Spaniel, Setters contain long flowing coats. To gather a smooth and comfortable brushing experience, you should use a soft medium bristle brush with medium-to wide-spaced bristles. Woolly undercoats: There are some dog breeds like sheepdogs, collies or shepherds have harsh outer coats with soft and woolly undercoats. Using a pin brush or firm bristle brush with wide-spaced bristle remove tangles and provides shiny coat. Thin coats: Naturally, Yorkies and Maltese dog breeds come with thin coats. Using soft slicker and wire-pin brushes are perfect to manage their coats properly. Slicker brushes also helpful to remove tangle and mats. Every brush is special for their different quality, and you should consider the coat type before choosing an effective brushing tool for your dog. Here we have described some common considerations you should keep in mind when picking one out. Proper brushes made up of some common purposes like massaging, detangling, grooming, removing flea, eggs, loose and dead hairs or add shine to pet’s fur. They are designed with a unique structure and have soft, hard or wired bristles. So you have to determine what you need a brush for. The right choice efficiently helps you to reach your objective with proper brushing. If you are not enough confidence to select the proper brush regarding your dog’s coat, obviously you can follow the vet’s recommendation. Every dog breed has not same coat length; they may have short, medium or long coat depending on their breed. For example, Yorkshire terrier or Maltese have long hair, Border collie or poodles come with medium hair, and Bulldog, German shepherd, or golden retriever contain short coat. There are also different brush types like bristle brush, slicker brush or pin brush specially designated for particular dog skin and coat. So, it’s completely your duty to identify the right brush type depending on your dog breed. Normally, it takes a long time to brush the large dog’s coat than a small dog with short hair. So, you should choose a brush with an ergonomic handle to avoid stress while brushing for a long time. Otherwise, you will be tired within a short time and may suffer from aching hand. So, it is very important to pick a brush with the anti-slip comfortable handle. Generally, pin-style brushes are special for dogs that have medium or short-length hair, but you should know about the actual shape and proper density of pins before finalizing. Pins those are nicely spread out and have rounded tips make sure healthy protection of your dog’s skin while brushing. Always try to apply very gentle pressure for comfortable brushing. Ensure about the cleaning mechanism, like how easy to clean or is it possible to completely remove dead hairs with this brush? Too big heads where pins are attached make an obstacle for easy brushing. Similar with a head the angle of the handle is also important to consider because without proper angel it is difficult to reach some areas of the body like stomach and base of the tail. So make sure the reachability with overall performance to get the best performance. Regular brushing helps to remove dead hairs, dirt, and debris from your dog’s coat. It also helps to circulate natural oils on the dog’s body and keep their coat soft and shiny. From various pet brushes in the market, really it is tough to select the best one for your dog. So, you need to compare in different angles before finalizing a brushing tool. There are different types of brush we have discussed above. Always try to select a large brush for large breeds and comparatively smaller brushes for a small breed. Along with various type and size brushes also come in many shapes like round, oval, rectangular and even triangular. But the oval shape is the most favorite of many pet owners for its special features. Triangle pin brushes are more suitable for long-haired dog breeds. It can reach some of those peculiar areas like under forearms, ears, or face. There are some other brushes also designated for short haired dogs. With the size, type, and shape of the brush, you must concentrate on the handle of the brush. It should make of rubber or wood and have a soft gel grip to fit well in your hand. The ergonomic design of this brush helps you to use it for a long time on your dog’s coat without any unusual physical stress. Maintaining proper routine is another good sign for brushing. If the dog familiar with regular grooming from the beginning of its life, it may more likely to well respond in next life. Regular brushing on your dog’s coat improves blood circulation and tones the muscles. Proper brushing also helps to spread natural oils created in dog’s skin around the whole body and makes hairs to look shiny and fabulous. Brush massaging help to remove dead skin cells to prevent skin infection and inhabitation of parasites. It also eliminates grass, pollen, and other troublesome elements. Regular brushing with appropriate tools strengthen your dog’s hair makes the coat healthier. Pet dogs spend most of the time at the indoor area and more likely to live in artificial lights and weather. It may cause unpredictable shedding in their body due to the lake of adapting with the seasons as wild dogs do. In that case, regular brushing helps to remove all loose hairs from their body. It also provides an opportunity to check bumps, lumps, or relevant skin problems may need addressing. Mats are not only painful these are too harmful to your dog’s body can lead to skin problems, irritations or rashes. Brushing provides you the opportunity to prevent tangles and hidden mats from the skin. It also facilitates to check other health concern before manifest into bigger health problems. Brushing may enhance the bonding between dog and dog owners. If your dog enjoys the brushing time then it would come to close and it can be a way for you to de-stress after a rough day. Brushing not only get rid your dog from unusual bumps or parasites also release from overheat and helps to stay comfortable. After all, a well-brushed dog looks nice, happier and healthier than as usual. Regular brushing removes dead hair and matted clumps of hair and helps to keep your dog’s skin and coat healthy and nice looking. It also lets you check your dog for anything about skin problem and take care of it. If you are enough confident about brushing technique then the dog will enjoy being brushed and you also will be happy for a healthy pet around your home. Step 1: At first, find a safe, quiet place and let your dog stand steadily. Make sure your dog feels enough comfortable and then check its coat for wounds, dead hair, mat, and tangles. Step 2: Before beginning to use let your dog sniff the brushing materials you are using. Start brushing at your dog’s head through its tail and applying the same technique every time will help you to complete the step easily. It is a great time to check any issue on your dog’s coat may cause more problems. Try to brush before your dog’s bathing to remove dead hairs and tangles. Step 3: Usually, it takes less time to groom short haired dogs and can be brushed quickly. In this stage, you need to polish fur by repeated stroking. Spray on some commercial pet coat conditioner like mink oil before brushing long-haired dog to remove knots and tangles. Try to maintain a regular brushing schedule and it can be once a week for short and medium haired pets. Dogs with long hair need to be brushed daily for a shiny and healthy skin. Step 4: Gently brush the hair around the ears because rough pulling hurt your dog immensely. 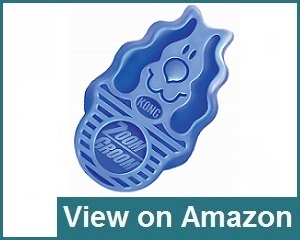 You can use a rubber curry comb, which is great to use on the paws, ears, and tail of the pet. It needs a bit of conditioning for tough matted hair, so apply a dollop of recommended conditioner on your dog’s coat and let it soak in for 15 minutes. Then, politely use a rubber comb in a circular motion all over the dog’s body to keep the coat soft and shiny. Step 5: Finally, ensure a soft and gentle stroke on your pet’s coat for a long lasting shine coat. Always try to brush in the same direction as hair growth and close to your dog’s skin, but not the skin itself. Use short strokes for short haired dogs and long strokes for dogs with long. Long-coated dogs, like Tibetan Terries, Collies needed to be brushed daily with long strokes. In that case, a pin brush may the good choice for its built-in features. Its bent-wire bristle helps to grip the undercoat and eliminate dead hairs without any stress. Short-haired dogs like Labrador Retrievers, Greyhounds don’t need to brush frequently. You may brush them every couple of weeks to remove loose hairs and tangle. Choose a bristle brush or a soft slicker brush comes with little bent-metal pins help to reduce dirt and dead hairs and distribute the natural oils on the skin surface. You need a slicker brush to manage short, wiry breeds like Dachshunds and Terriers. It comes with a stripping knife helps to remove mat and dead hair in the undercoat. Always brush your dog’s coat through the direction which is naturally growing. Don’t pull on the dog’s coat, it may break or damage the hair and can cause of very discomfort to your dog. Use a pet spray or conditioner if the dog has deep mats close to the skin. Let it shock in for 10-15 minutes and then stroke gently through a rubber comb to erase mats and keep the coat soft and shiny. If you have a decent budget, purchase the top quality brushes to fulfill the overall needs of your dog. There are various brushing tools available in the market for the different purpose but you will have to consider your dog’s size, age, coat, and skin condition before purchasing and it will make easier for you to cross the long run. Remember, an ideal brush can save your time and keep your dog’s coat shiny and healthy. Question: How often should I brush my dog? Answer: Actually, it depends on your dog’s coat type. For short-haired dogs, it is needed to be brushed once every week. But for dogs which have long coat need to brush daily to remove dead hair and tangles and keep the fur shiny. Question: Is it possible to use a brush on thick fur? Answer: It is a bit challenging to brush a dog with thick fur because it is expensive to manage a professional groomer. But if you select the right tool and capture some brushing techniques, then it will be easy to care for your tick furred pet at home. Question: How much time should be brushed in each session? Answer: For an adult dog, brushing session can last up to 30 minutes. Brush your dog as long as it takes to eliminate tangles, dead hairs or dirt on your dog’s coat. Question: Is there any difference between a brush and a hair remover? Answer: Basically, a brush is completely designed to groom your dog’s coat and remove dead furs from their coats. But a hair remover is designed with the different purpose; it physically extracts hair from your dog’s body while grooming. Question: Is it safe to use my hairbrush on my dog’s coat? Answer: Although there is no prior difference between dog brush and human hairbrush, a used canine brush is not enough hygienic to use for the human. Dog’s skin may carry harmful parasites and there is a possibility to transfer these into your own hair by using a used brush. You really make it seem really easy with your presentation, however, I find this topic to be actually something which I feel I would by no means understand. It kind of feels too complex and very large for me. I’m looking ahead in your subsequent publish, I’ll attempt to get the grasp of it! The place else may I am getting that kind of info written in such an ideal method? I’ve a undertaking that I am just now operating on, and I’ve been on the lookout for such info.